Gillian Clarke is a writer with a deep sense of attachment. Born in Cardiff in 1937 and living now in Ceredigion, Clarke held the position of National Poet of Wales from 2008 to 2016. Her newest collection of poetry continues this relationship, but also broadens it: the landscape and the culture of Wales is a part of her, and she a part of it. The collection is divided into six chapters, with common themes threaded through poems in each. The first, titled “Missing,” may be personal but conjures up those childhood experiences that everyone carries in memory. Six of the ten poems here use the word ‘father’, but the rest carry his ghost as Clarke’s lines reverberate with memories of the man: “his miner’s hands gnarled as oak” and “his steps on gravel/or the basement stairs”. Poems are peppered with morsels of Welsh language. “A Year at Hafod Y Llan” has whole couplets, handily translated in the “Notes” appendix, which imply the speech of individuals in the scene addressed. The same poem (and others) contain singular words, where Welsh works better than English: “hefting the weight, treading the shape of it / cynefin in their bones, nerves, blood.” ‘Cynefin’ is a fine choice here, and the word itself becomes the title of another poem later in the “One Year” chapter. Clarke’s notes translate it as “heft, knowledge,” but the word also carries connotations of familiarity and “habitat”, and it pops up again and again through Zoology’s pages. Stanzas are mostly short and regular, with few poems spilling over one page. Welsh aside, the language is straightforward. Rhyme is rare, and although we are treated to a playing with sound in lines like “The moan of wind in these stones/is the lovely monotone”, Clarke’s emphasis is on evoking of a wealth of image and feeling within short phrases. A six stanza poem, with lines such as “Ten centuries on, an April wind / brought down the king of trees. It fell unseen”, express the history and feeling with such polished brevity that not a word is wasted. References to landscape are specific and sensual; people are full and present. The final chapter of the collection is “Elegies” and has poems dedicated to not only Hedd Wyn and Wilfred Owen, poets who died before Clarke was born, but also Nelson Mandela and, not quite last, “Olwen.” These entries are richly emotive and fill the reader’s mind with Clarke’s memories as though they had experienced her subjects first-hand. Clarke’s attention to the lives of animals is central to Zoology. Chapter II is titled “Behind Glass,” and Clarke acknowledges the Museum of Zoology in Cambridge for their support during her 2015 residency. 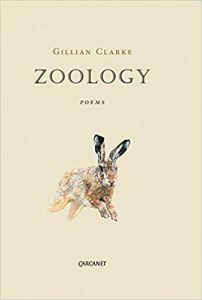 Her poems give us lustrous images of the creatures Clarke surveys, contemporary or long extinct. She doesn’t bring them to life as such but rather meditates upon their deaths; each is vivid, endowed with an emotional weight. “Ichthyosaur” lays bare a fossil in a case and invokes also a stillborn lamb, a “small obstetric tragedy”. The reference is incongruous at first, but Clarke dwells upon this lamb and, later, offers a string of poems witnessing the stillbirth and death of the mother ewe. Upon second reading, the Ichthyosaur’s death becomes full-colour, traumatic and visceral. Moments of birth and death are woven throughout the collection, and Clarke circles around the same points again and again. As with other themes the effect is intensification, to the point that reading becomes a journey through the landscape and a meeting with the people she is writing about. With her precise sense of time and place, Clarke has put together a collection that deeply embeds these personal relationships. The poems in Zoology are wonderfully evocative of images and memories alike.